The core of the Hindu religion is its philosophy of Vedanta. Vedanta is a science. Just as physics, chemistry, biology, are sciences of the objective world, Vedanta is the science of the subjective world. It is the science of life. It provides answers to questions such as: What is the goal of life? How should one live life so as to achieve that goal? What is God? What is man, and what is the relationship between God and man? The principal forums through which Chinmaya Mission disseminates this man-making knowledge of Vedanta are Jnana Yajnas and Spiritual Camps. Jnana Yajnas are five to seven days series of public discourses on a Vedantic scripture given by an Acharya of the Chinmaya Mission. Jnana Yajnas are regularly organised by all Chinmaya Mission centres. In a traditional Vedic yajna, the ritual calls for the invocation of Fire and other deities in a sacrificial trough. As devotees single-pointedly offer oblations into the trough, they chant Sanskrit mantras and hymns of praise for blessings and protection. It is from the image of this ritual that Swami Chinmayananda coined the term, ‘Jnana Yajna.’ Here, the spirit of sacrifice and cooperation are retained, but instead of offering grains and herbs in a physical fire, ignorance and negative tendencies are sacrificed in the fire of Vedantic knowledge. ‘Jnana Yajna’ is also a term used by Lord Krishna in the Bhagavad-gita to refer to the study of scriptural texts by a student as a ritual of worship at the altar of Knowledge. To invigorate and inspire the masses for Vedantic scriptural studies and consequent contemplation on them, trained teachers, swamis/swaminis and brahmacharis/brahmacharinis of the Chinmaya Mission conduct periodic Jnana Yajnas on various spiritual texts and subjects. Spearheaded by Swami Chinmayananda in 1951, this method brings the knowledge of the scriptures to the general population. Jnana Yajnas could spread over five-to-seven days with 60-90 minute public discourses every day on the Bhagavad-gita or other Vedantic texts. Jnana Yajnas are free of charge. Gurudakshina is a voluntary offering devotees make to the Acharya on the concluding day of the yajna. The Indian tradition of Gurudakshina is a way of showing gratefulness and respect to the Guru. It was an attempt to repay one’s teacher or Guru after a period of study in the Gurukula. The repayment was not always monetary. At times, a teacher would simply ask his student to execute an important task. However, the Guru often received a valuable gift or donations from the pupil and his family as Gurudakshina. Though the life style of Indians has changed majorly down the years, yet the reverence and respect we pay to our teachers still remains largely intact. At Chinmaya Mission – in keeping with the old age tradition – knowledge is available for all and at no charge. Thus, at the end of a Jnana Yajna – the beneficiaries offer Gurudakshina to the Acharya as a token of gratitude. It also highlights the fact that knowledge should not be taken for granted. The offerings received are used for sustaining and furthering the propagation of knowledge and Mission activities. Organizing a Jnana Yajna is an effective way to introduce Vedanta to a community. For the organisers, Jnana Yajnas are cooperative endeavours that unite bands of like-minded people and provide a field for their learning and spiritual growth. For the attending community members, the event has manifold benefits at their personal, familial, and societal levels. 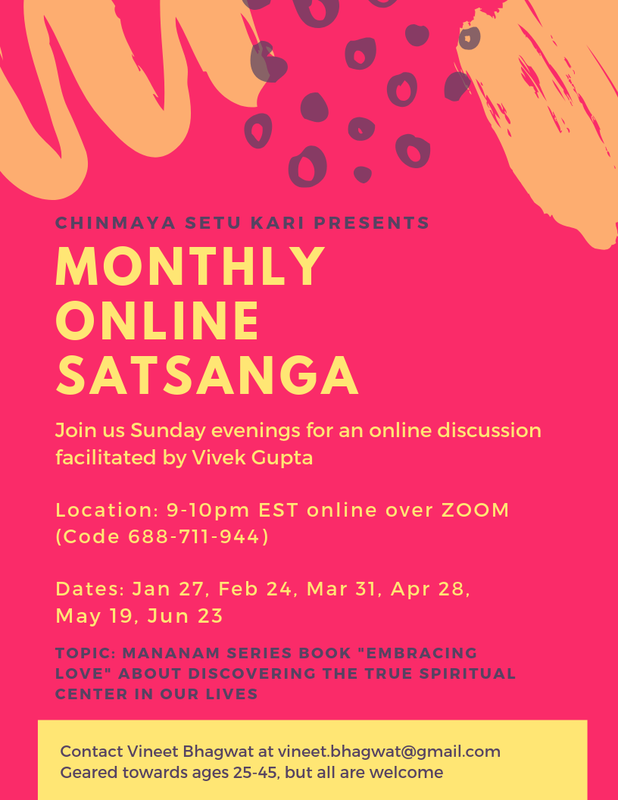 Chinmaya Mission’s Acharyas are invited throughout the year, by Mission and non-Mission devotees, to conduct Jnana Yajnas, satsangs, seminars, workshops, discourses and other special events. Spiritual Camps are week-long retreats organised by Chinmaya Mission in various ashrams and other locations all over the world. 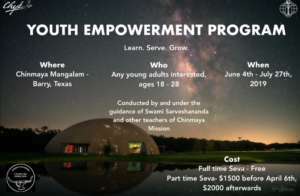 Throughout the year, Chinmaya Mission centres worldwide host spiritual camps or intensive residential courses for adults, children, youth, or the whole family. 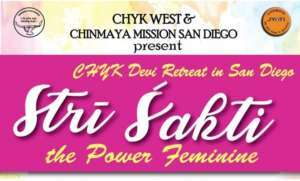 Mission devotees also often choose to take a solitary retreat and stay at Mission ashrams. Spiritual Camps are normally weeklong retreats where the devotee is encouraged to temporarily ‘renounce’ the world, briefly shelve daily problems and spend time in study, contemplation and introspection. It is an opportunity for total immersion in knowledge and devotion. The first National Camp was held in Mumbai from April 15 to May 5, 1972. It enabled seekers from various parts of the country to enrol as delegates and live a twenty-four-hour day engrossed in spirituality for a period of two weeks.The first Chinmaya International Spiritual Camp was also held in Mumbai in 1984. A typical camp starts with an early morning session on guided meditation followed by classes on the scriptures (Upanishads, Bhagavad-gita, or other texts of Vedanta). Throughout the day, members are kept absorbed in spiritually oriented activities: group discussions, satsangs, karma yoga and bhajans, as well as cultural programmes where camp participants offer their diverse talents as an offering to the Lord. In short, for one week or more, people hear, talk, and live Vedanta! Family camps have special features of fun-filled learning for the children including stories, discussions, quizzes, arts, crafts, creative games and skits which cater to different age groups. 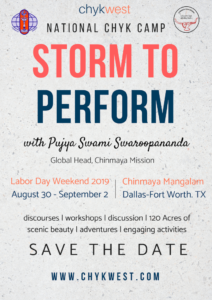 Swami Chinmayananda’s grand vision envisaged a spiritual retreat for the entire family where young ones from an early age could partake and be inspired by the ancient wisdom of the Vedas. Hosting a Chinmaya spiritual camp is a noble and dynamic endeavour filled with teamwork and a cooperative spirit. Centres typically invite Mission Acharyas to conduct the spiritual study classes and to help plan the rest of the day’s activities so the mind can have healthy fun and easily become contemplative for study.